The humble light bulb gets the smarts. 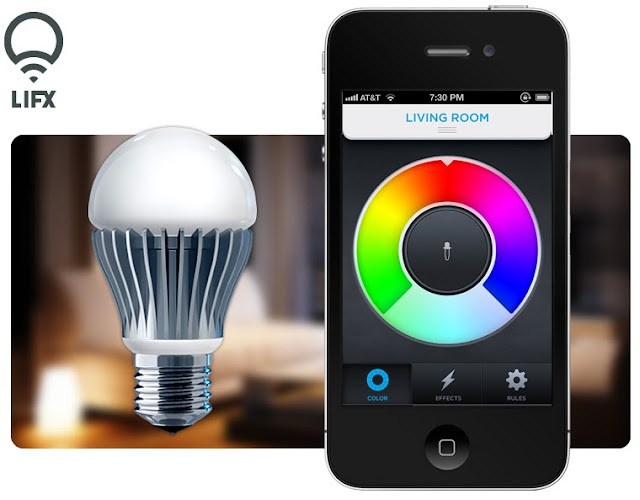 The LIFX is a Wi-Fi enabled, multi-colour, energy-efficient LED that you can control with your smartphone! Installing it simple. Just replace your existing bulb, flip the switch 'ON', and launch the LIFX app on your smartphone. After which you will be guided through a process of choosing your home Wi-Fi network from a list and then entering your password. The LIFX bulb will auto-configure itself to your router - and if you've installed more than one bulb, the slave bulbs will auto-connect to the master. The best part, each smart bulb can be controlled individually: Using your phone, you can adjust its brightness, change the light colour — every LIFX bulb can create millions of colours — control individual bulbs, rooms or even the entire home. If you're wondering, LIFX bulbs use just 10 per cent of the energy that standard bulbs consume, and are rated for 40,000 hours or 25 years of use. Now imagine your home, where smart algorithms control LIFX's brightness so you can wake up naturally with automatically increasing light in the morning, or drift off to sleep with slowly dimming lights. Or, better still, a romantic evening with that someone special where your mood lighting automatically matches the soft serenade that's playing on your stereo system. Ships in Aug/Sept 2013; prices starting at $79 (Rs 4,700) per unit.